Aromas are primarily of blackberry and raspberry with a hint of vanilla, nutmeg and violets. On the palate, there is an effusive fruitiness underlain by raspberry liqueur and cassis. The tannins are extremely velvety giving the wine a lush, mouth filling richness with a long finish. Oak plays a minor but important role, adding richness and structure to the blend. We stumbled upon this wonderful little gem upon the first meeting we had with Trent Moffett. At that same meeting, when we left I was told I was rude by my other half because I expressed my opinion about another wine. The next time I met with Trent, he expressed appreciation for the honest opinion. I think that is a trademark for why the wines of the Moffett Family are so well regarded, respected and sought out… he listens to what people want and are seeking. The 2004 Gemstone Vineyards Red is highly regarded and is in rather short supply. I’ve acquired 4 bottles and am offering them to our blog readers first at a price of $75 (from $103 previously) each plus S&H, first come shall be first served…. call 828-414-9111 and mention the Gemtree closeout special offer! Cypress Grove is one of the most sought after and award winning creameries in North America, specializing in Goat’s milk and Sheep’s milk cheeses. 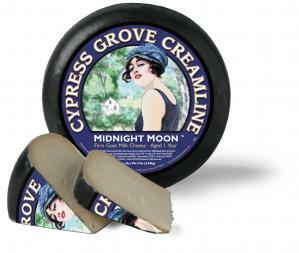 Midnight Moon is a hard goat’s milk chevre reported to be aged six months or more.The production of Cypress Grove’s Midnight Moon is overseen by Mary Keehnin Holland as a goat’s milk style of aged gouda… who better to evoke help for gouda than the dutch! This pale, ivory cheese is firm, dense and smooth with the slight graininess of a long-aged cheese. The flavor is nutty and brown-buttery, with prominent caramel notes. The wheel is finished in a beautiful black wax. My recommendation for wine pairings are 1) Tony Coturri’s Frieberg Vineyard Zinfandel, 2) Page Cellars Proprietary Red Blend, or 3) A bright, crisp Fatesca out of Moldova. With any of these wines and Cypress Grove’s Midnight Moon, try a dense fig and hazelnut paste served over the cheese for an added depth of flavor! 1. Heat 2 tablespoons of the olive oil in a large sauté pan and set on medium-high heat until sizzling, about 2 minutes. Add the artichokes and cook until browned, about 3 minutes on each side. 2. Using a slotted spoon, transfer artichokes to a bowl, leaving as much oil in the pan as possible. Reduce heat to medium, add the remaining 3 tablespoons oil and the onion, stir until well coated and cook for 5-8 minutes. Add the garlic, celery, red pepper flakes, capers and olives and cook for 3-5 minutes. Stir in the tomato sauce and basil, heat until the sauce is bubbling and cook for 3 minutes. Stir in the cocoa powder and cooked artichokes and simmer 5-8 minutes. 3. In a small saucepan on high heat, boil the vinegar and sugar until reduced by half and quite syrupy, about 2 minutes. Stir into the cooked vegetables and simmer on very low heat for 3-5 minutes. 4. Transfer caponata to a bowl and refrigerate overnight. perfectly paired with a godello wine, or a petite verdot! Among my personal favorites in the cheese world, Piave is a hard Italian cheese that pairs beautifully with fruit, most foods, and most wines. But as with most foods there is so much more to the tale than just that. Piave is named after the river Piave, whose source is found at Mount Peralba in Val Visdende, in the northernmost part of the province of Veneto, Italy. The land surrounding the ancient river is integral to the character of the cheese: it is where the milk is collected, the curd cooked, and the cheese aged until hard. Piave has an intense, full-bodied flavor, reminiscent of Parmigiano Reggiano, that intensifies with age and makes this cheese absolutely unique. While most people prefer a bold, spicy red wine with their piave, I’ve never had a complaint from a white wine drinker about it’s pairing-ability either! It seems that this time of the year, we’re constantly asked for simple recipes so people can enjoy their parties and families. One of my favorite recipes for cranberries is this simple relish that freezes well and is loved by the most ardent hater of this zesty little fruit! In a food processor, coarsely chop the cranberries, add the lemon zest, orange zest, sugar, cocoa, cayenne, and salt. stir together well and add the juice of the lemon and orange and mix well. refrigerate for 1 hour and serve. If you need a nice syrup over french toast, or another breakfast item, add more juice and boil into a simple syrup! Pairs well with Sauvignon Blanc, Fatesca, Syrah, Cabernet Sauvignon, and Mencia Wines! This time of the year, we’re all looking quick and simple finger foods to have at a party, or take over to the family gathering. If your family is like mine, there’s probably plenty of reason to have some wine around so the recipe has got to pair with the cheapest, or finest of wines on the market! These simple Ginger Brie Cups are perfect for just about any occasion and as all of our favorite recipes, they pair wonderfully with the nectar of life -wine! 1 small package of brie (plain chevre may be substituted if desired) withe the rind removed and placed in the corner of a plastic storage bag. 1 jar of ginger jelly or preserves as preferred. Heat your oven to 350-400 degrees F.
Allow the brie or chevre to come to room temperature and snip the corner of the plastic storage bag to form a pastry piping bag. Pipe the cheese into the tartlet shells to a near full point. Spoon the Ginger preserves, or jelly on top of the brie. Bake for 5-10 minutes till the cheese and preserves melt. This wine is very similar to the wines that I tasted in Austria more than 25 years ago. Unlike other Steele and Shooting Star red wine bottlings, our Blue Franc receives little, or no, oak aging. Some liken our Blue Franc, depending on vintage, to Pinot Noir in lighter years and Zinfandel in the riper vintages. Sometimes it is totally akin to a top-flight Gamay from Beaujolais. The wine is clean, crisp, and unpretentious with tons of fruit, including warm berry pie, complementing the traces of pepper, almond, cherry and cinnamon. Our Shooting Star Blue Franc has soft tannins, medium body, great color and is the perfect red wine to enjoy over the summer with any festive occasion. It is excellent with appetizers, cheeses, BBQ, and picnics. Recently we had the opportunity to try the Blue Franc on the deck with a toasted sandwich of smoked chicken, grilled onion, and avocado – quintessentially quaffable!